The prefinished frosted glazed oak shaker room divider is the perfect door to allow light to filter through your home whilst maintaining privacy between rooms. This option would be ideal for bedrooms or dining areas, as well as living areas that you’d like to keep more secluded. This frosted oak internal room divider door system is ‘Frenchfold’ which goes one step further than your average internal French door. This unique system has a one or two door opening access just like internal french doors, but it can also fold back allowing the whole space to be opened up like an internal bifold door. This provides the ultimate in versatility for your home. 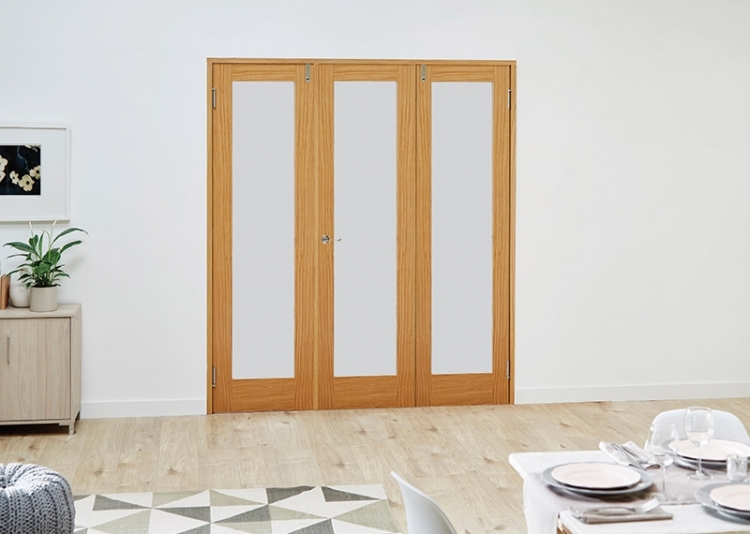 This popular frosted glazed shaker door design is offered in several opening sizes from 1684 wide through to 2826mm, and is also available in pre-finished oak and white primed. Installation is simple as the selection of 3 and 4 door systems, which use 533mm, 573mm, 610mm and 686mm wide doors make it easy to find the right fit. Please refer to our storage and decorating recommendations before installing the doors. A joiner is recommended for installation. These sets are standard joinery products, so can be adjusted in both height and width. The height can be reduced by up to 50mm, and the width can be reduced by 30-40mm. The Climadoor oak glazed frosted shaker room divider set comes with universal frame set, pivots, hinges, brushed stainless steel drop bolts and pre glazed oak doors. You can personalise with your own handle and latch! Fully finished for added durability and minimum fuss. Frosted glass provides privacy whilst maintaining light flow.